We have discussed the possibility of something wintry on Thanksgiving with members over the past week and made sure to note that this was a highly uncertain forecast. The reason is that the European weather model showed a major east coast low but has since backed off that prediction. The GFS and Canadian model showed this as well but now they all keep the energy much weaker and separated from the northern jet stream. As a result, we will not see enough cold air to bring in anything wintry this time around. 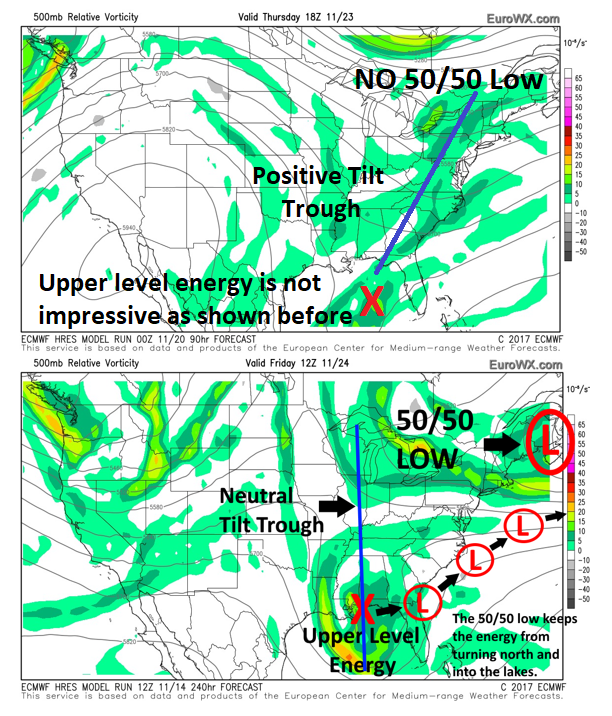 Notice in the map below that we sent out to members, where the upper level energy was expected to go versus what really appears to happen now. It is still early in the season though and this will NOT be the only wintry threat. 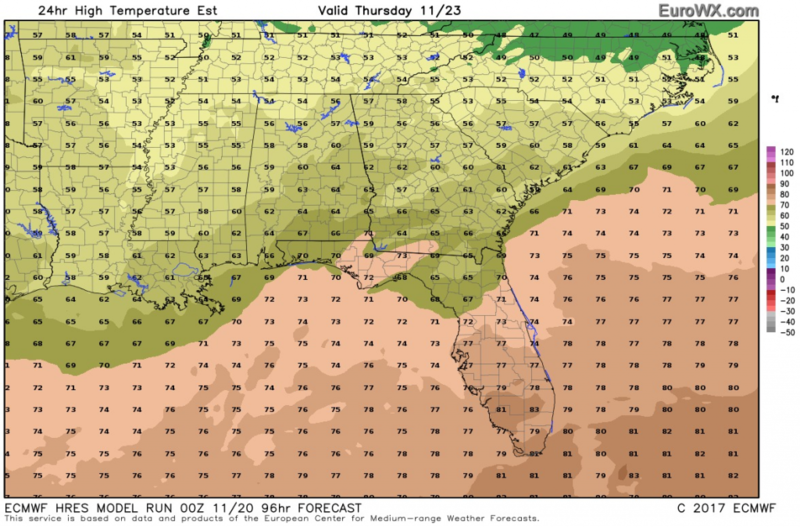 The day before Thanksgiving will feature a chance for areas along and East of I-77 and I-20 corridors to see some scattered showers but probably nothing too heavy. Thanksgiving is going to be partly to mostly cloudy for much of the viewing area with below normal temperatures in the Carolinas and near normal further south into Georgia. As you move closer to the coast on Thursday, rain will be more scattered in nature but clearing will move in from the west during the day. Overall, this Thanksgiving will be much colder than the previous two have been. We provide a much more in-depth discussion for our subscribers and invite you to join and see why hundreds of businesses and residential clients depend on us for their weather. We do not sugarcoat the forecast and we will call it as we see it. We provide insight into long-range forecasts and let clients know what to expect in the weeks to come. We correctly predicted this recent colder weather nearly two weeks before it occurred. When most weather outlets went with a warm November based on one computer model, we predicted a more normal to slightly below normal month. Give us a try and see the difference.